I can’t believe I’ve reached the last few weeks of summer and posted only posted TWO recipes to this blog. Bad food blogger, bad! Perhaps I should give myself a bit of lee-way; it’s been a busy and at times difficult summer. Between a stressful job, a house full of much-loved guests, and a spouse with multiple broken bones from a sports injury, there hasn’t been much time to sit down and breathe, let alone focus on blogging (or much of anything else). Only after quitting my job, bidding fond farewell to our wonderful guests, and putting my hubs on the road to recovery has life finally slowed down to an easier pace. Halle-freaking-lujah! Of course, I’m one of those people that – despite wanting a break for months – has to fill their first waking moment of free time with activity. In this case, I was only 10 minutes into relaxing on the couch with some Investigation Discovery (it’saddictiveAF) before deciding to have a casual peek at my recipe collection. Casual peek quickly transformed into detailed research, which then morphed into a cooking and baking agenda for the next four months (and a shopping list as long as a novel). And so went my rest time; I was on my way to the market before the murder had even been solved. It was nice knowing you, R & R! All credit for this beautiful salad recipe goes to Cafe Delites, one of my favorite blogs of all time. The garlicky honey mustard dressing is the BOMB.COM – I’m not a mustard fan by any means, yet I devoured this salad in under 5 minutes! It also makes an unbelievably delicious marinade for the chicken – my husband already requested that I make this again soon. It’s a definite keeper – enjoy! Whisk marinade / dressing ingredients (through salt) together to combine. Pour half into a shallow dish, submerge chicken and marinade for 1 1/2 to 2 hours. Refrigerate the reserved marinade to use as a dressing. Wipe pan over with paper towel; drizzle with another teaspoon of oil and fry the bacon until crispy. Slice chicken into strips and prepare salad with leaves, tomatoes, avocado slices, corn and chicken. Whisk 2 tablespoons of water into the remaining dressing and drizzle over the salad. Sprinkle the bacon over the top and season with salt and freshly cracked pepper, if desired. Temperatures have FINALLY dipped below 50 degrees in Southern California, which can only mean it’s – da da da daaaah – SOUP WEATHER! What to say about this recipe? It’s caprese. In a soup. And it’s A-M-A-Z-I-N-G with a buttery grilled cheese sandwich. Definitely a recipe for the ‘make this again!’ folder – enjoy! Preheat oven to 400 degrees Fahrenheit (200 degrees Celsius). Place the tomatoes and garlic on a large roasting tray, drizzle with 1 tablespoon olive oil and roast in the oven for 25 minutes, or until tomatoes have burst and garlic is soft. Remove tray from oven and set aside to cool slightly. Squeeze the roasted garlic from its skin and place in a blender with the roasted tomatoes, sun dried tomatoes, sugar, 50 grams of basil, vinegar and 3 tablespoons olive oil. Blitz until smooth, then run through a sieve (if desired, to remove tomato seeds). Spread butter on both sides of bread slices. Place one slice on a preheated griddle or grill pan, cover with cheese slices and grill until bread is of desired texture and consistency. Top with second bread slice, flip sandwich, and grill as desired. Repeat with remaining bread slices and cheese. Transfer soup to serving bowls and top with shredded buffalo mozzarella and remaining basil. 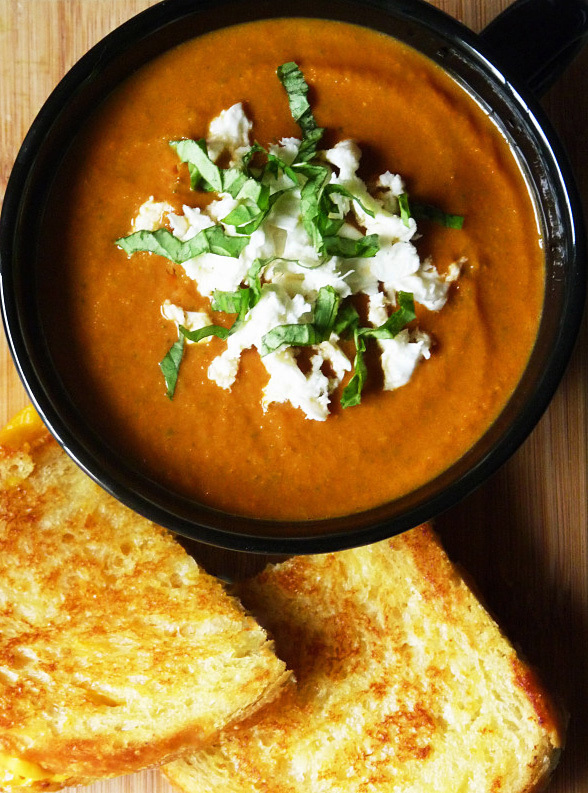 Serve heated through with grilled sandwiches.